On March 20 1998 the first curl release shipped – but as it was built on a previous project there was already a handful of contributors. It was then just a modest little project with but a few thousand lines of code in total. As time has passed, the project has grown and development has been going on at a rapid speed in a never-ending cycle of releases and bug fixes. The first couple of years I didn’t keep track of every single contributor properly, but one day in 2005 I decided to go back and try to collect the names of all the helpers so far. Names that had been mentioned in the changelogs and comments etc. When looking at our history, it is therefore not really sensible to look at the numbers before that cut-off date as I didn’t keep the count and logs properly before then. All since then, I make an effort in properly giving credit to all contributors: patch producers, bug reporters, documentation writers as well as people “just” providing good advice. I try to mention all contributors. To give credit where credit is due. In a volunteer driven project, that is after all the best compensation I can offer. Looking back over the years it seems the pace of newcomers have been quite steady. The 437 names in 2005 have grown to 1005 in less than eight years. Roughly 70 new contributors every year or 6 per month. Now, in February 2013 with the release of 7.29.0, we surpassed the magic 1000 named contributors limit in the project. 1000 contributors in about 5437 days. On average one new soul every 5th day over a period of almost 15 years. Fascinatingly enough, even if I count a more recent period like the last 6 years the pace is only a little faster with one new just a little faster than every 5 days! The names that didn’t quite make it and that all exist 8 times in the THANKS file are Steve, Robert, Richard, James, Dan, Christian, Andrew and Andreas. As I’ve mentioned before: not that many females in there. In the end of January 2013 we got a fresh security vulnerability pointed out to us in the curl project (it was publicly announced on Feb 6). Another buffer overflow. This time in the SASL Digest-MD5 handling for POP3, IMAP and SMTP. It is the 16th security flaw during curl’s life-time of almost 15 years so it isn’t a disaster but still of course it is never fun when it happens. I put a lot of my own effort and pride into this project so every time something like this floats to the surface my pride and self-esteem get damaged a bit. Everyone who’s concerned about open source and security and foremost in a reliable and secure libcurl of course now wonders: how did this happen? How could this piece of security problem get into libcurl and what are we doing to make sure it doesn’t happen again? Let me tell you the story. It is not as interesting nor full of conspiracies as you’d like. It is instead rather dull and boring but nevertheless the truth. I’m the lead developer and maintainer of curl and libcurl. I personally have done some 65% of all commits in the project and I do the majority of all code reviews on the mailing list. Our code might be used by some 500 million users, but the number of regulars that can be considered the “core team” can still basically be counted on a single hand. Also, we all do this primarily on our spare time. During intense development periods we get flooded by bug reports and patch submissions and my backlog grows. It’s really not possible to foresee when these periods come, but occasionally it seems the planets align in this way and work piles up. In order to then proceed the best way in the project, I try to focus on the architectural and “deep” matters that need me and my particular knowledge most. I then try to leave the “easy” problems that are easier to work on to others, and I try to stay away from the issues that already seem to be under control by some of the existing regulars in the project. I also have to let other “elders” in the project push things with slightly less scrutiny just to be able to plow through the work better. Unfortunately this leads to the occasional flaw getting through and in this case it was even a security vulnerability that when you look back on the code you really cannot understand how we could miss this. We do take security seriously though and we make a big effort on handling all security reports swiftly and accurately. Even if this was the 16th time we let our guard down, I want to think that we at least react responsibly and in a good way when we realize our mistakes. Please don’t judge us due to this. Please instead consider joining us and help us review code and help us find the next flaw before we merge it into mainline or at least before we do a public release with the code! As a representative for the team behind curl and libcurl, we’re of course proud to yet again having shipped a release to the public today. Over 240 commits, with in total almost 10000 lines added and 6000 removed since the previous release in November 2012. We’re only a month away until the curl project turns 15 years old. We fixed a nasty overflow vulnerability we have been shipping in a few previous releases. The flaw existed in code used by IMAP, POP3 and SMTP. We introduced a new test suite output mode that is “automake compliant”. This can help linux distros and others who want to run many test suites and have a unified way of parsing the results and outcome. It follows the spirit of ptest and I believe it will be used in the future. The IMAP support got a lot of improvements and lots of login and authentication fixes were brought in. 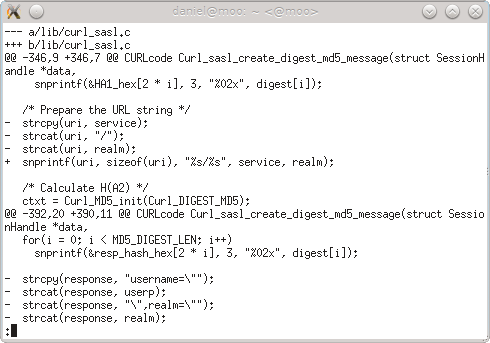 Now libcurl supports the sasl methods digest-md5, cram-md5, ntlm and login., and it also recognizes the login disabled server capability. 35 specified bug fixes were crammed in as well, and there are a bunch more we haven’t mentioned that just “silently” improved the multi interface functionality.